Buoy Full Flavor Pipe Tobacco is a bold and robust blend of tobacco that focuses on a strong and traditional tobacco flavor. This flavor is perfect for any expert smoker that is not afraid of bold and aromatic tobacco flavors. Every single bag of Buoy Pipe Tobacco comes in a thick, reseal able plastic pouch, ensuring freshness. Using a unique packaging technique, Buoy is packages with virtually no shake while retaining a very fine cut. Buoy Pipe Tobacco is a uniquely simple blend of tobacco that focuses on a finer cut than the big brother Golden Harvest. 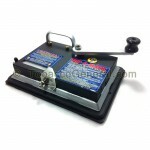 The result is a more roll your own friendly cut of tobacco at the same reasonable prices you are already used to. Manufactured by Rouseco, Inc. in Kinston, North Carolina, this tobacco uses the finest locally grown tobaccos available to bring an unmatched smoking experience. Or #1! It stuffs even better since we up-graded to Powermatic II. I'll give Buoy full flavor tobacco 4 stars. Just a basic, general purpose tobacco. Smokes and tastes o.k. Rolls o.k. Price is good. Have ordered again. This tobacco is the preferred type that fills every tube. I highly recommend not purchasing light or silver as it has tobacco weird stuff in it. If your tobacco is too strong use the filter choice to correct it.Gold or ultra light tubes in the 100 mm correct this nicely. 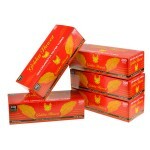 Menthol smokers will love golden harvest menthol 100 mm tubes with this tobacco.